The most interesting people you’ll ever talk to are those who are wildly passionate about something, whether it’s knitting or string theory. Their energy is infectious. It doesn’t matter if you care about what they care about, chances are you come away from the conversation with renewed appreciation for our amazingly interconnected world. Maybe with renewed enthusiasm for your own passions too. That’s why I’m jealous of Garth Sundem. 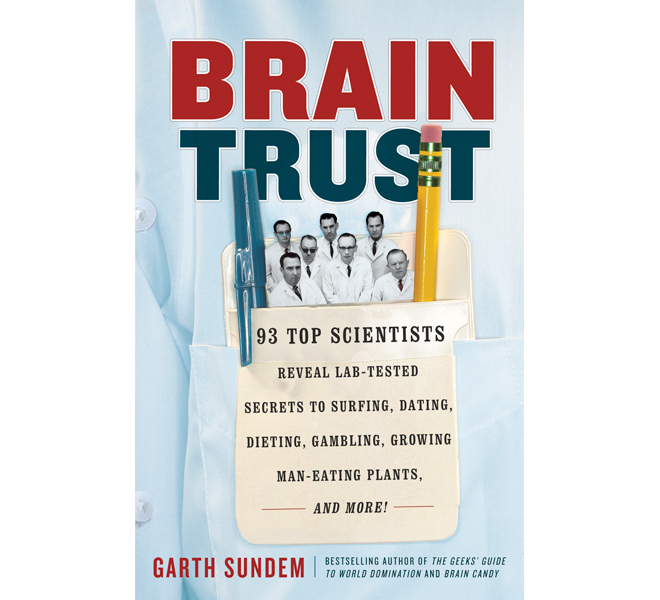 This writer (and puzzlemaster at GeekDad) got to talk to smarties like MacArthur geniuses, Nobel Laureates, and National Medal of Science winners for his new book Brain Trust: 93 Top Scientists Reveal Lab-Tested Secrets to Surfing, Dating, Dieting, Gambling, Growing Man-Eating Plants, and More! . Okay, he conducted many of these interviews by phone, evading the noise of kids and family dog by sitting in his car parked in the garage. That didn’t take away from the thrill of hearing backstories behind some of today’s more alluring science. Like these. You hear the story of psychologist Stephen Greenspan’s initiation into the science of gullibility when his mother duped him into marrying his then girlfriend. Or about mathematician Ian Stewart’s wife trying to use rotational mechanics to teach their malfunctioning cat to land on its feet. You get to listen to statistician Wayne Winston yelling at USA basketball while on the phone because his model predicted a wider point spread. You hear about how MIT prosthetics researcher Hugh Herr replaced his lost legs with DIY feet to climb some of the most difficult rock faces in the world, or how physicist Charles Edmondson used the geometry of roadways to chase down a turbo Porsche with a lowly Dodge Neon. Sundem extracts the most fascinating information from these interviews, putting it in clear and wry accounts that are short enough to read while waiting for a child’s piano lesson to end. In fact this is exactly the sort of book I like to keep in the car to grab in those moments when we need a diversion. This worked well recently when several of the book’s 18 puzzles saved us from the tedium of waiting for a table at a packed restaurant. That doesn’t mean everyone will prefer to absorb it bit by bit. This is the sort of book my husband reads in one sitting. It’s loaded with brain food. Here are a few tasty bites. How animal stickers can help teach your toddler to have perfect pitch. Why low self-esteem is linked to purchases of flashy, overpriced products (we’re looking at you Donald Trump). What numbers to avoid when playing the lottery. How uncertainty is related to choosing junk food. What color to paint your car if you want to make it thief-proof. The only sour note? Of the 130 scientists interviewed, a tiny fraction in the book are women. Chances are a man secure enough to use the word “ejaculations” to describes leaves, acorns, and French fries falling from his car door doesn’t make that sort of mistake. Instead this probably reflects the state of women in science today. That’s changing. The number of science and engineering degrees awarded to women continues to increase. So shall our real brain trust. Disclosure: GeekMom received a review copy of this book.